Insurance products are offered through Virginia CU Insurance Services, LLC (VACUIS), an insurance agency affiliate of Virginia Credit Union, Inc. (VACU), and Southwest Business Corporation (SWBC) and are underwritten by unaffiliated insurance companies. SWBC is not an affiliate of VACUIS or VACU. Any insurance required as a condition of an extension of credit by VACU is not required to be purchased from VACUIS, and can be purchased from an agent or insurance company of the member’s choice. VACUIS is licensed in Virginia only. Business conducted with VACUIS is separate and distinct from any business with VACU. VACU is not responsible for products and services purchased through VACUIS or SWBC. Neither VACUIS nor SWBC is insured by NCUA or any federal government agency. Insurance products offered through VACUIS and SWBC are not a deposit of or guaranteed by a credit union or credit union affiliate, and may lose value. Not insured by NCUA or any federal government agency. 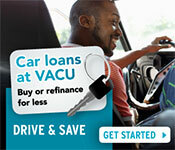 Not a deposit of or guaranteed by a credit union or credit union affiliate. May lose value.